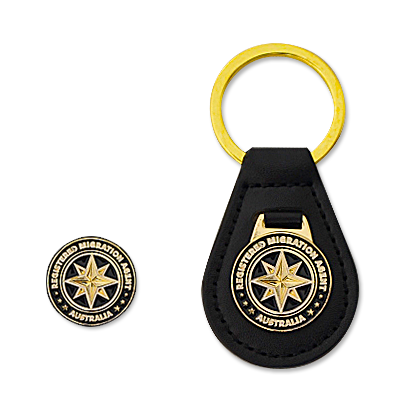 Only Australian Registered Migration Agents with a current, full registration may place an order for a Registration Card, Practising Certificate, Lapel Pin and/or Keyring. Orders are processed and mailed to RMAs on the same day. To foster love of and pride in being a Registered Migration Agent, and to uphold the principles of the Code of Conduct. A compass rose, sometimes called a windrose or Rose of the Winds, is a figure on a compass, map, nautical chart, or monument used to display the orientation of the cardinal directions (north, east, south, and west) and their intermediate points. It is also the term for the graduated markings found on the traditional magnetic compass. This is the symbol of the work done in our profession. To place your order, please complete the following application form. All form items are required in order to process your application. Photographs should adhere to the guidelines as stipulated by the Australian Passport Office. If you would like us to use your photo from the OMARA website, please do not upload a photo. If there is no photo uploaded or displayed on the OMARA website then your certificate / card will show no photo.